Five for Friday~ Random Projects! except that it is on Tuesday! Who has a day off on a Tuesday? 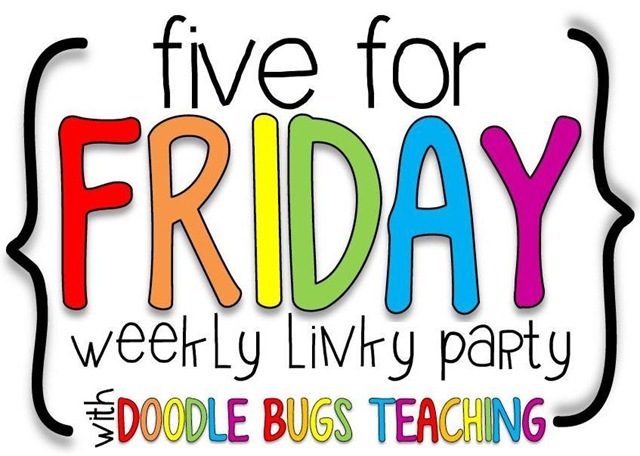 Anyway, thank goodness for Friday and for Five for Friday. Thank you so much Kacey for this weekly linky that we all love! 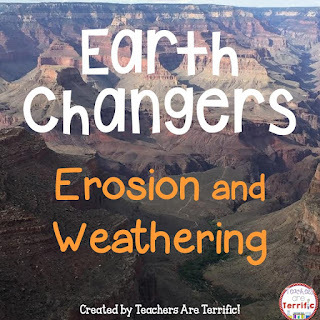 This week I decided to give you a peek into my classroom! It has been an amazing week. I have been able to just walk around the lab tables and listen in on the talk about our projects. The kids are almost 100% engaged and the talk is about what they are working on.....with a little football talk every now and then. After all, we do live in Alabama...Roll Tide! Let's start with third grade! 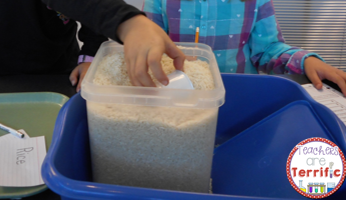 We have been learning about volume with an amazing challenge that involves popcorn. 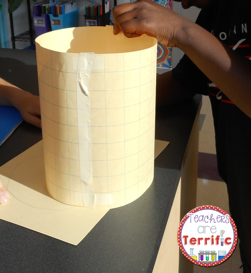 Students are challenged to build a container for a specific amount of popcorn. Their containers are really funny and, for the most part, really too big. Next, they tried to determine why a certain number scoops always happens when you fill containers! It's pretty messy, but effective in working on a perception of volume and that volume might depend on the containers- not the stuff in them! We have been building platforms! 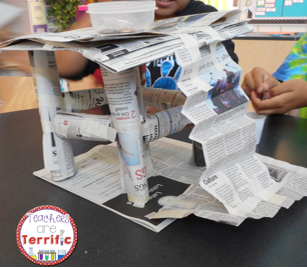 The biggest problem kids are having is making it a platform and not Rapunzel's Tower! 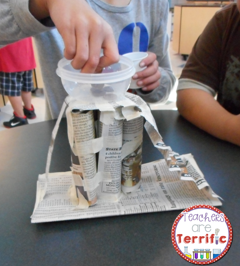 I love this challenge- TWO supplies- newspapers and tape! 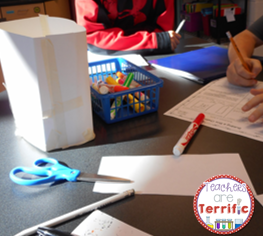 We have learned all about calculating volume and surface area and then the challenge was to build a box with the greatest volume possible- if everyone begins with the same beginning surface area! Pretty clever design on this one. That cube shape has the greatest volume of any class so far! What is up next in the lab? I will leave you with a funny of the week! How did we live before Pinterest? Love your meme! How did I teach or give gifts or organize my house or plan parities or do things with my nieces before Pinterest??? I have a small addiction!!! Yay to a day off - although it is funny it is on a Tuesday, but I'll take it! I am debating working on Tuesday, or going in a day this weekend and then staying in my jammies on Tuesday. I think that option may win! 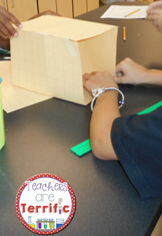 Your class looks awesome - so many fun activities going on with the different grades! Thanks for visiting Alex! 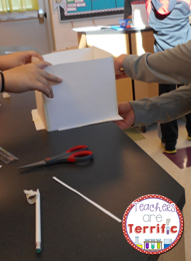 The lab is fun, but I like to think the kids are also soaking up some learning- even though they do not know it! Your dad must have been an engineer at heart! I certainly am! 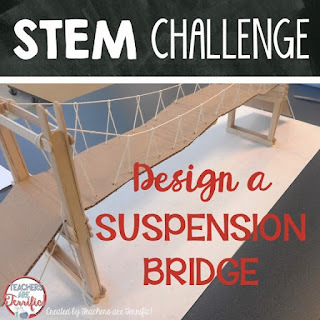 The next challenge my fifth graders are going to do is a specific bridge design. Right now they have homework to watch a video I created and then do a little research so they will come to class with ideas. I fully expect they will go to Pinterest and Google! 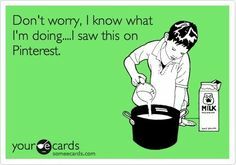 Pinterest...lol. It is crazy to think what it was like before. I am amazed everyday how much we use the internet, and I'm just in K, I know the older grades use it even more. I would feel lost without it. I so wish we had the budget to have specialized science teacher like you. 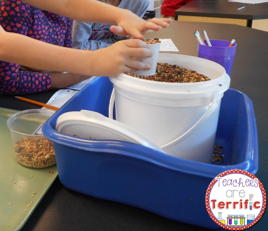 Wow, you are always doing such fantastic experiments with your kiddos. It really is amazing what they have been coming up with. We are lucky, we get Monday off too so I am loving my 4 day weekend. I'll be thinking about you...lol. Although I am sure one of the days I will go work in my room anyway. Five for Friday- the Bridge Version!